AT LAST Pope Benedict BREAKS HIS SILENCE, HE SPEAKS TO US WORDS THAT CAN STRENGTHEN OR FAITH AND HOPE. LET US PRAY FOR HIM AS HE GROWS PHYSICALLY MORE FRAIL BUT OBVIOUSLY RETAINS SHARPNESS OF INTELLECT. LET US HOPE THAT HE WILL CONTINUE TO SPEAK TO US. April 10, 2019 (EWTN) – On February 21 to 24, at the invitation of Pope Francis, the presidents of the world’s bishops’ conferences gathered at the Vatican to discuss the current crisis of the faith and of the Church; a crisis experienced throughout the world after shocking revelations of clerical abuse perpetrated against minors. > It should be seen by every legislator, every Judge and every person and student in America. > Her “conversion moment” in the film brought tears to my eyes, and I remembered all the women I’ve counseled over the years, —the ones tempted to abort, and those who had succumbed to the temptation. The suffering of the latter group goes on, and the world doesn’t care or recognize the double tragedy, —the death of their unborn children and the death of their souls in surrendering themselves to the Lie. It is a fine film, truly powerful, and I cannot recommend it enough. As I said, everyone should see it. > Only Christ is the answer, His law, His mercy, and His new Life. This is a truly powerful film and it can change hearts. I cannot recommend it enough; everyone should see it. > Oremus pro invicem! We must pray for each other! We are all facing constant deception in this world by the Evil one. In “Editorials”This entry was posted in Ecclesiology, News and tagged antipope, Bergoglio, Canon 188, Canon 332 §2, Jorge Mario Bergoglio, Pope Francis. The Editor says:January 10, 2019 at 4:33 pm	I will point out immediately, that the primary and in some cases the only tactic liars will take against this article, will be to boo hoo me that I said what I said, rather than whether the statement is founded upon the truth. They will do this because they cannot contest the truth upon which it is founded with any valid reasons. Next they will call me a sedevacantist, even though in the article I expressly affirm that Benedict is the pope. Other than that, they will probably call me names such as heretic, or schismatic, since for them only the heresies and false claims of Bergoglio remain as the definition of truth: the Gospels, Tradition, the perennial magisterium, the recent magisterium of Benedict XVI, Canon Law be damned, they will say under their breath. Albinus Falco says:January 10, 2019 at 7:29 pm	Your thesis entails that not only every Cardinal and Bishop in union with the Church but also the Pope himself (Benedict) gave public approval (at least tacit) in 2013 to the fact that Francis became a valid Pope in 2013. Your thesis thus entails that the Magisterium has erred in a matter of dogmatic fact. This is impossible. Therefore your thesis is false. You haven’t satisfactorily responded to this objection in any of your articles thus far on this site. In my opinion it is an insurmountable objection. For if your thesis is correct, then you must concede that the Church can err in dogmatic fact. But if that is the case, then the Catholic Faith falls apart. The Editor says:January 10, 2019 at 10:41 pm	The Church has not erred in a dogmatic fact, because the dogmatic fact is that Pope Benedict XVI is validly elected, Bergoglio not. A fact does not admit an error. If you mean to say that the Church has erred in its opinion regarding a dogmatic fact, then again you assertion is false, because those who err in matters of dogmatic facts are ignorant and their ignorance is not ascribed to the Church. If you mean to say that the Bishops and Cardinals are infallible in matters of dogmatic facts, that would only apply if the Magisterium of the Church were enacted to declare the fact, and then we agree the Church could not err. But no such canonical judgement has been made on the validity. As Canon 332 §2 shows, if its invalid by the law itself in virtue of any defect, no matter HOW many Cardinals or Bishops think otherwise, its still invalid. Sorry, your sophistic argument is completely invalid. antigon (@antigonistes) says:January 11, 2019 at 10:59 am	Perhaps yet more notable, regarding Mr. Falco’s flawed analysis, is that in the mid/late 4th c., virtually the entire episcopate, including the pope of that era, either apostatized or acquiesced to the Arian heresy denying Christ’s eternal divinity; & that the laity of the Empire, as revealed in Bl. JH Newman’s magisterial study, not only substantially held to the Faith, but eventually helped to bring the lost bishops back to Her. That laity to be sure had Athanasius, Hilary of Poitiers & but a handful of other bishops with them (& the Faith), whereas so far we have the illustrious Bishop Gracida, to some extent Msgr. Bux in his call to investigate the validity of BXVI renouncing the ministerium of his papacy (tho not its Munus as the Church thru Canon Law mandates for a legitimate abdication), & perhaps those who for imperfectly admirable reasons have yet publicly to join Bishop Gracida, despite knowing he is, like Athanasius was in his time, obviously right. Mr. Falco’s chief error is holding that tacit acquiescence means dogmatic fact. T’is of course quite true the Church cannot err when She upholds truth, to wit, a dogmatic fact, just as it is that tacitly accepting Bergoglio’s a pope has no more a dogmatic quality in se than the tacit & often explicit 4th c. claim that the ‘magisterium’ of its day demonstrated Arianism, not Catholicism, must necessarily be true. While a serious & honest exploration would be welcome of why the great 4th c. episcopal apostasy did not in fact constitute any Magisterium of Christ’s, & thus comparably how tacit acquiescence to a substantial error in our own time is no more the voice of the Magisterium than acquiescence to Arianism was then, it’s not even strictly necessary. It’s not for the excellent reasons outlined in the editorial above, but – save for declaring tacit acceptance equals dogmatic fact – it isn’t even so by Mr. Falco’s own reasoning. Because at no point, despite all the quite undogmatic tacitness, has the Church made any formal declaration regarding the validity of BXVI’s supposed abdication, not to say of the 2013 Conclave. She has not, despite Msgr. Bux’s call for the episcopacy to investigate said legitimacy, even tho that would be the perfect means to declare its validity formally, which is to say arguably dogmatically. It seems accordingly fair to propose the reason Msgr.’s call has been met with so little enthusiasm stems from awareness that an honest investigation must reveal what the evidence clearly demonstrates: that BXVi did not renounce his papacy’s Office, or Munus (as well as that his effort to renounce its ministerium, or function, was a substantial error rendering that too invalid, ‘by the law itself,’ according to Church teaching via Canon 188), that he accordingly remains, however inactive, the sole living Pontiff of the Catholic Church, & thus that Bergoglio’s but another in the Faith’s long list of pathetic antipopes. Those are not tacit agreements, but instead, as the evidence does & any serious investigation will reveal, quite simply dogmatic facts. You are following this blog, along with 1,673 other amazing people (manage). §2. If it happen that the Roman Pontiff renounce his MUNUS, there is required for validity that the renunciation be made freely and manifested duly, but not that it be accepted by anyone whomsoever. These 2 errors make it appear that in the mind of Pope Benedict there is NO distinction between the Petrine Office (which must be resigned) and the Petrine Ministry (which you can resign without resigning the office). It also makes it appear that his act of resignation of the ministry effects the loss of office. convoquei-vos para este Consistório não só por causa das três canonizações, mas também para vos comunicar uma decisão de grande importância para a vida da Igreja. Depois de ter examinado repetidamente a minha consciência diante de Deus, cheguei à certeza de que as minhas forças, devido à idade avançada, já não são idóneas para exercer adequadamente o ministériopetrino. Estou bem consciente de que este ministério, pela sua essência espiritual, deve ser cumprido não só com as obras e com as palavras, mas também e igualmente sofrendo e rezando. Todavia, no mundo de hoje, sujeito a rápidas mudanças e agitado por questões de grande relevância para a vida da fé, para governar a barca de São Pedro e anunciar o Evangelho, é necessário também o vigor quer do corpo quer do espírito; vigor este, que, nos últimos meses, foi diminuindo de tal modo em mim que tenho de reconhecer a minha incapacidade para administrar bem o ministério que me foi confiado. Por isso, bem consciente da gravidade deste acto, com plena liberdade, declaro que renuncio ao ministério de Bispo de Roma, Sucessor de São Pedro, que me foi confiado pela mão dos Cardeais em 19 de Abril de 2005, pelo que, a partir de 28 de Fevereiro de 2013, às 20,00 horas, a sede de Roma, a sede de São Pedro, ficará vacante e deverá ser convocado, por aqueles a quem tal compete, o Conclave para a eleição do novo Sumo Pontífice. Ich habe euch zu diesem Konsistorium nicht nur wegen drei Heiligsprechungen zusammengerufen, sondern auch um euch eine Entscheidung von großer Wichtigkeit für das Leben der Kirche mitzuteilen. Nachdem ich wiederholt mein Gewissen vor Gott geprüft habe, bin ich zur Gewißheit gelangt, daß meine Kräfte infolge des vorgerückten Alters nicht mehr geeignet sind, um in angemessener Weise den Petrusdienstauszuüben. Ich bin mir sehr bewußt, daß dieser Dienst wegen seines geistlichen Wesens nicht nur durch Taten und Worte ausgeübt werden darf, sondern nicht weniger durch Leiden und durch Gebet. Aber die Welt, die sich so schnell verändert, wird heute durch Fragen, die für das Leben des Glaubens von großer Bedeutung sind, hin- und hergeworfen. Um trotzdem das Schifflein Petri zu steuern und das Evangelium zu verkünden, ist sowohl die Kraft des Köpers als auch die Kraft des Geistes notwendig, eine Kraft, die in den vergangenen Monaten in mir derart abgenommen hat, daß ich mein Unvermögen erkennen muß, den mir anvertrauten Dienst weiter gut auszuführen. Im Bewußtsein des Ernstes dieses Aktes erkläre ich daher mit voller Freiheit, auf das Amt des Bischofs von Rom, des Nachfolgers Petri, das mir durch die Hand der Kardinäle am 19. April 2005 anvertraut wurde, zu verzichten, so daß ab dem 28. Februar 2013, um 20.00 Uhr, der Bischofssitz von Rom, der Stuhl des heiligen Petrus, vakant sein wird und von denen, in deren Zuständigkeit es fällt, das Konklave zur Wahl des neuen Papstes zusammengerufen werden muß. As a schoolboy, George Washington copied out in elegant script the 110 Rules of Civility & Decent Behaviour in Company and Conversation. Later on, our first President tried to figure out how a head of state who was not a monarch should conduct himself with his fellow citizens. His solution was to be a gentleman, obedient to those rules of civility that he had learned as a boy. This has nothing to do with snobbishness, and it has everything to do with moral perception of human dignity. Anyone who dresses in casual clothes for significant events because “it makes me more comfortable,” or who speaks loudly or interrupts others, is advertising his barbarity. Even Viking marauders paid attention to their ceremonial vesture and lyrical literature. A lesson can be learned from the Prodigal Son, who squandered his father’s inheritance and ended up living like the swine. The Christian has a baptismal dignity that should inform all of his manners and conversation. “So whether you eat or drink, or whatever you do, do it all for the glory of God” (1 Corinthians 10:31). Civility is defined by the Oxford English Dictionary as “politeness,” but that makes sense only as regard for the dignity of others. People using their iPhones and “texting” in restaurants, oblivious to those seated next to them, are disdainful of God’s creatures and the art of conversation. And those who tolerate cursing, or who lapse into vulgarisms themselves, have little approval from St. Paul: “Let no unwholesome word proceed from your mouth, but only such a word as is good for edification according to the need of the moment, so that it will give grace to those who hear” (Ephesians 4:29). Consideration for the sensibility of others is supercilious only to those who have lapsed into a boorishness that simmers under the surface of every civilization. And by the way, George Washington’s 110 Rules of Civility were composed in 1595 by French Jesuits to instruct their students. Many of them went on to civilize much of the world. Are 1P5 Skojec’s Fear of a Cardinal Investigation of Francis’s Validity & the “Skojec Little Book of Insults” Interconnected? The Catholic Monitor received a second comment from the former public relations and (apparent) semantics expert OnePeterFive publisher Steve Skojec that was puzzling. Before I get to the first and second comments I believe I owe the Remnant a apology for the headline “Remnant & Skojec are Wrong in saying Francis is same as Benedict & John Paul II” because for the most part only two of its writers appear to take the extreme positions of the OnePeterFive publisher: Hilary White and Robert Siscoe. ‘All that remains to be determined, then, is the exact moment when the acceptance of the Church becomes sufficient to render the proposition de fide. Is it as soon as the cardinals propose the elect to the faithful who are in the immediate locality, or only when knowledge of the election has sufficiently spread through the whole world, wherever the Church is to be found? The problem is that Steve says “if the explanation of John of St. Thomas is correct” and he assumes it is correct thus infallible, but the only proof he gives is the John of St. Thomas quote. Replying to @SteveSkojec @dhgyapong and 2 others You think he agreed with ANYTHING Francis has done? Sorry, Steve, but if Benedict “agreed” with “everything” that “Francis has done” then they are the same. Skojec sounds like Francis who said that diversity of religions is only God’s permitted will to Bishop Athanasius Schneider, but on paper says it is God’s positive will. That is why he is called the public relations pope because he know how to use semantics like a public relations expert. In the post “Curiouser and Curiouser: Who Dispensed Jorge Bergoglio SJ from his vows? (See: Curiouser and Curiouser: Who Dispensed Jorge Bergoglio SJ from his vows? )” the Roma Loluta Est website makes the strong case that Bergoglio possibly might not be pope because it appears no one dispensed him of his Jesuit vows. This gets us to the second point of my article in which Steve claims with Robert Sisceo that it is a “infallible certain[ty]” that despite much evidence of a unlawful conclave election that Francis is a 100% for sure a valid pope the SAME as Benedict and Pope John Paul II. Why didn’t he didn’t bring this that up in his second comment? Maybe because he apparently knows his “universal acceptance” claim is falling apart. 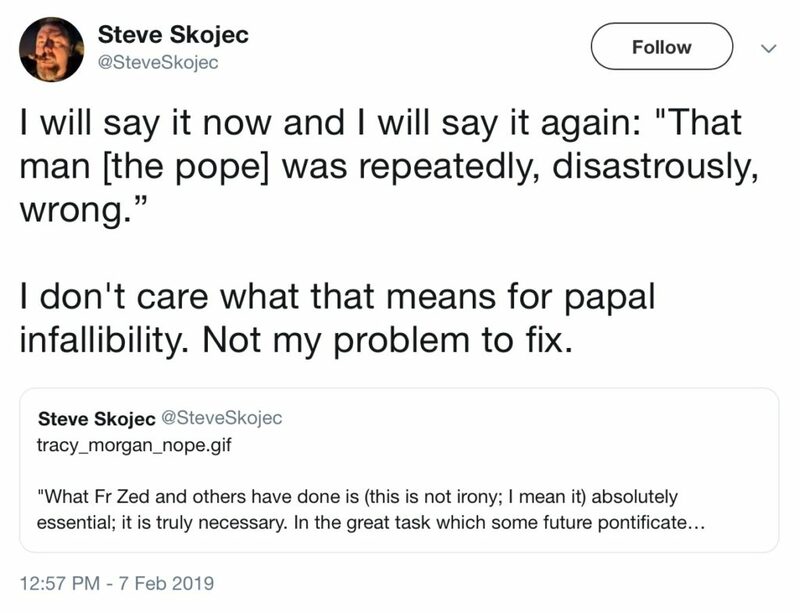 That may be the reason he seems afraid to argue against all the evidence that his idea is wrong (See: http://catholicmonitor.blogspot.com/2019/03/1p5-skojec-claims-that-pope-universally.html?m=1). The problem apparently is Siscoe, who is Skojec’s mentor in the “universal acceptance” claim, is possibly either a poor scholar or possibly a bit disingenuous in his leaving out the second part of a quote by a Doctor of the Church. Did Siscoe leave it out because he is a poor scholar or for some other reason or because it said “for a certain time”? What does “for a certain time” mean? Is that “certain time” immediately at the conclave or is it a few years after the conclave? Does this possibly mean that since Francis “afterwards… for a certain time… was not accepted universally… then, the pontifical see would be vacant”? Moreover, Siscoe can’t have it both ways in his quotes when they apparently contradict each other. But getting back to Siscoe’s selective quote of St. Alphonsus, a good place to go to find out what the Doctor of the Church really meant is to go to a scholar who quotes him in full. (2) Saint Alphonse de Liquori , Verita della Fede, in “Opera…”, vol. VIII. P. 720, n. 9.
lus Eccl. Univ., tom. I, pars II, p. 376, n. 99; Caietan , De Auctoriatate…, cap. XXVI, n. 382, pp. 167-168. Finally, I ask Siscoe and Steve to specifically answer if Francis was not “lawfully elected” then does a “peaceful and universal acceptance” overturn a unlawful election? More importantly, why are Siscoe and Skojec apparently so afraid of a investigation by cardinals since they continually ignore or avoid addressing the subject by the “universal acceptance” mantra? APRIL 5, 2019BY KODY WAYNE COOPERBoth believing and non-believing students of Strauss will find Leo Strauss and His Catholic Readersrewarding. Birth Control, Blood Clots, and Untimely Death: Time to Reconsider What We Tell Our Teens? Do narcissists ever admit that they’re wrong and sincerely say sorry and seek advice from their friends to try to change or fix the situation? When Narcissistic individuals lose something that they value, they are sorry. They can be perfectly sincere when they say they are sorry. Unfortunately, what they mean is a bit different than what the wronged person is actually hoping for. They are not being empathic and regretting doing something that hurt you. They are sorry about the consequences to them. Punchline: Narcissists are low on empathy and self-centered. Unless they have spent years in therapy working on themselves, they are highly unlikely to admit that they were wrong and be sincerely regretful about the impact of their behavior on someone else. In private practice in NYC and the author of the book: Borderline, Narcissistic, and Schizoid Adaptations: The Pursuit of Love, Admiration, and Safety.